The 3555 Avanti Sunbridge features a double berth forward with vanity, sink, hanging locker, drawers and privacy door. The Mid-Cabin consists of a spacious dinette to starboard that converts to another double berth. Just aft is the head and shower. The well-appointed galley is to port. Just aft of the galley is a settee and under-cockpit double berth with privacy curtain. Large cockpit area has helm chair with guest seating opposite dinette, wet bar and aft lounge. A pair of hatches aft of the cockpit provide good access to the engines. Sleeps six overnight, four for a weekend and two indefinitely. Complete Galley with stove, microwave, refrigerator and coffee maker. Hot and cold pressurized water. Complete head with shower. Two eating areas, one below in salon, one on bridge near Captains seating. Complete console on bridge. Hose-off on swim step. Storage though-out. Stereo in main salon with amplified speakers forward, mid cabin and aft. Two sets of trim tabs for fast plane, boat is capable of 30 mpg over the water. High capacity thermostatically controlled A/C heating system. GPS, ship-to-shore radio, Flat screen TV. New bottom paint October 2014 before winter storage. Professionally maintained. Can be seen at Island Cove Marina, Captiva Dock. Serious inquires only. • Engine: Twin 5.7 Liter Mercruiser V-8 engines (480 hours) • Length: 35' 5" (LOA 38') • Beam: 11' 5" • Draft drive down: 3' 8" • Weight: 10,200 lbs empty • Fuel: 205 gals. • Water: 50 gals. (hot and cold) • Waste: 34 gals. • Deadrise aft: 19 deg. 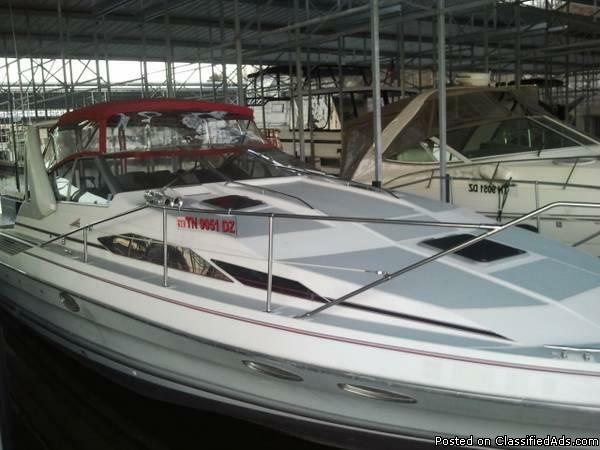 1997 Bayliner 3255 Avanti The Bayliner 3255 Avanti Express has earned its place among mid-range sport cruisers for its good looks and extensive list of standard features. No other express-style cruiser in its class offers its room and comfort below decks. Exceptionally large windows admit plenty of light for an open, airy feeling. Accommodations include forward V-berth that doubles as a lounge with removable table, four-place dinette, private double mid berth, complete electric galley, and private head with shower. Topside, the large open cockpit opens to the swim platform via a fully-integrated transom door. Integral bow platform, radar arch, a full acrylic canvas weather enclosure, VHF radio, trim tabs, dual 30-amp dockside power, and compass are among the 3255's standard features. BAYLINER'S AVANTIS Bayliner's Avanti line combines dramatic, contemporary styling and leading-edge design with old-world skill and craftsmanship. Manufacturing teams apply leading-edge technology and meticulous hand-crafting to every stage of construction. A crew of technicians subject each new model to extremes of stress, endurance and punishment to ensure that every Avanti exceeds every expectation. Each Avanti offers a five-year structural hull limited warranty that's fully transferable to protect your investment and assure years of trouble-free boating. Avanti, the most luxurious cruiser in its class, features all the amenities of home. With its spacious cockpit and seating area, the Avanti is perfect for all-day cruising or entertaining. !!! !PRICE REDUCED!!!! 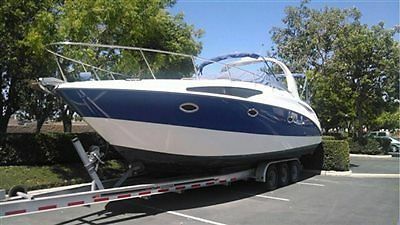 1991 Bayliner Avanti Sunbridge 3055 Cabin Cruiser 4 Beds (3 in cabin 1 in cockpit) * Upgraded 454 with 750 edelbrock marine carbK&N Turbo filter with air induction * New hoses and belts 2013New starter 2014 * 1 new battery 2014, 1 in 2013, 1 backup 20113 bank battery charger 2013 * 3 bank battery controller 2014Merc Bravo 2 outdrive (rebuilt 2013) * Custom Stainless Steel 4 blade prop 2013Trim Tabs * City water hook up 2013Upgraded electrical entrance and wire 2012 * Ship to Shore switch with 3000 watt inverterCustom 1 piece Graphics 2012 * All lights changed to LED with Blue LED accent lightVHF radio * Remote Search light with flag pole 2012V Berth (V Queen bed) * Dinette (Twin bed)Aft cabin (Queen bed) * Cockpit (oversized Twin bed)Raritan sewage treatment system 2012 * Electric flush toilet 201263 gallon fresh water tanks 2013 * 2 new fresh water pumps 2014110 chest freezer 2013 * Ac/Dc fridge-freezerNew microwave 2013 * Marine water cooled 16K BTU Ac/Heater 2012New faucets 2013 * Upgraded water lines-valves-systemNew Auto bilge pumps 2014 * New Am/Fm/Cd radio 2013Tri Axel trailer (6 new tires, 2 new axels, permanent tags) Has always been a fresh water boat (never in the salt) My family has enjoyed this boat for nearly 4 years now and have invested a lot of time and money making sure it is water safe and convenient with all the necessities and luxuries for a long weekend stay on the water. Though the boat is a 1991, it looks newer and has been taken care of (with signs of 23 years on the water). We are only getting rid of the boat so we can upgrade to a large House boat for more room and comfort. The boat is docked at Stonewall Jackson Lake in slips 61/62 and can be seen by appointment. The boat is also USCG Documented (Meaning no Title, personal property taxes, fees or anything “very nice”). Serious offers encouraged and welcomed. 32 MPH!!!! and handles great. 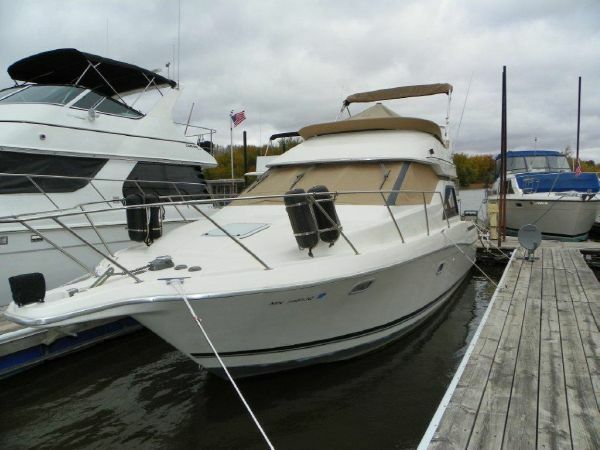 This Vessel is for sale Locally and is also listed on numerous other websites for sale, The Seller reserves the right to cancel this listing at any time due to the boat being sold otherwise. I was asking $30,000.00 OBO, the price was reduced to $28,000.00 OBO now that my new boat is on its way I would like to get this one on its way to you so I have reduced the price to a thousand below what I have invested in the boat and would entertain any serious offers (please don't low ball me with a 15K offer) so the buy it now price is set at $24,000.00. 7/8/14 the front windows have been replaced and look nice! BIN PRICE WAS JUST LOWERED!!! RELISTING AGAIN. 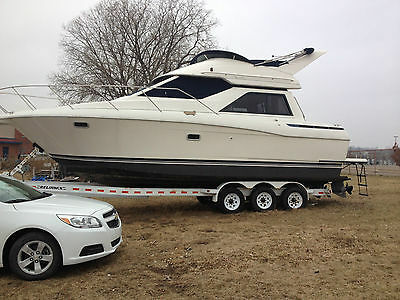 BUYER DID NOT COMPLETE TRANSACTION AND LEFT NEGATIVE FEEDBACK WITHOUT SEEING THE BOAT. USE YOUR CHANCE TO OWN A GREAT FRESH WATER BOAT FOR THE FRACTION OF PRICE Please read below. I purchased this boat almost two years ago in August from original owner who sold it only because of service mistake. Air conditioner hose was lose and boat got water in engine compartment and stern of the boat was submerged in fresh water. It was removed from water right away, water was drained from all systems, engines were flushed and boat was cleaned. It was winterized by marina in October 2013 and has not being in water since. Boat has some minor fiberglass damage where cleat was located on port side, it got broken when boat was removed from water (can be seeing on pictures), otherwise hull is in very good shape. With good buff it will be like new again. Pictures are from December, 2014 when I was there first time since I purchased the boat. I was happily surprized with the condition of the boat. This is my short report (I am retired marine tech and have a lot of experience of salvaging boats). Temperature was 50F that day, so I inspected the boat and found out that almost all the systems and gauges and switches were operable, but one voltmeter gauge on flybridge. Both engines's ignition and fuel pumps and starters were engaged from both controls. Starboard engine starts right up, runs well and sounds really good. Outdrive shifts fine both forward and reverse. Trim pumps work fine both up and down. Port engine does not start, it has brand new starter and it's possible that the cause is in the gimbal bearing being locked up. Did not have time to remove outdrive to have it checked. In worst case if port engine needs to be removed - the engine compartment is huge, or you can pull engine out and work on it in cockpit. In other words there is enough room so you can work inside the boat without any problems. Generator does not start but it turns over with starter and cylinders are filled up with Marvel oil - probably needs some fuses replaced. Flybridge cushions have good vinyl, but foam inside should be changed. Boat is fully loaded, has twin Mercruiser 5.7 250 hp engines, Bravo two outdrives, Kohler generator 5 KW, air conditioner, hot & cold fresh water system, large head with shower cabin, home-style kitchen and can sleep up to 6 people. Flybridge is huge and can sit up to 8 people. I'm attaching all the images I have. 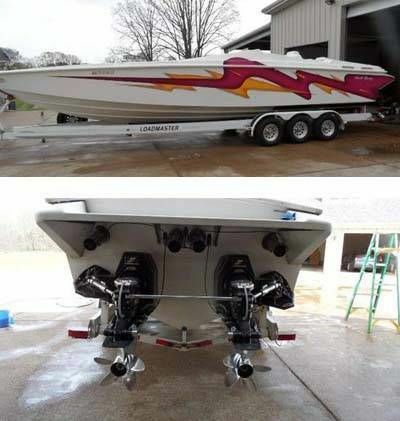 Purchased this boat to bring it to Toronto, Canada, but could not arrange transportation to Canada (I did once, but shipper just stole $3000 and never delivered the boat) and boat was stored in marina for a two years now. I have to let it go since my plans changed, my loss is your gain, this boat is totally worth some effort fixing it up and can make your weekends an interesting adventure. There are too many project boats now, but this one has a lot of potential because it has NEVER been in salt water and was just splashed in fresh water.Boat is located in Dubuque, Iowa. If you recognize the storage location please do not show up there without appointment, you will not be allowed to see it unless I authorize it. 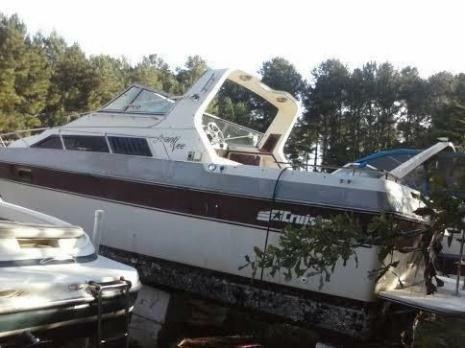 I have clear title for this boat Storage is paid and boat can be released to buyer ater transaction is completed.NON-REFUNDABLE DEPOSIT IS REQUIRED WITHIN 24 HOURS?, so ask your questions before bidding. PS. My boat has a lot of interest, but someone is trying to sabotage this sale, hitting BIN and stopping auction. It takes time and money to relist it. NO ONE has ever contacted me after hitting BIN and NOBODY has come to view the boat, so it was relisted not because of misrepresentation or other reason. I AM NOT GIVING IT AWAY, SO PLEASE DO NOT DO IT AGAIN. I AM AN OLD MAN AND DO NOT HAVE TIME TO PLAY GAMES. My description is based on the information I received from original owner and my personal inspection... Please do not ask me, if generator and port engine work... I DO NOT KNOW. I had no time to check them, especially generator..., (I prefer inverters anyway). I was not able to turn port engine over by hand (It was cold and if you know that Bravo engine almost impossible to turn by hand when all the belts stay on) Consider that they do not work and need replacement. My description is very accurate, for items that I was inspecting.Also some buyers tried to negotiate price telling me that they had an information that boat was submerged completely. I DID NOT FIND ANY EVIDENCE OF WATER IN BOTH HELMS, GAUGES, ELECTRIC PANEL and STARBOARD FUEL TANK. I have more than 30 years of experience with boat repairs, so more than confident that my boat needs minimal work to get running and no major repair needed, but consider the worth... Trailer is not available with the boat, winning bidder will have to arange transportation. It will cost $200 to load boat on your trailer.